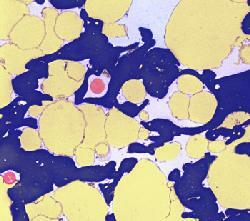 Most foods consist of components in the form of particles large enough (>1 µm) to be visible under a light microscope. Optical microscopy makes it possible to stain the components and thus characterize them by colour. Confocal laser scanning microscopy increases the resolution of traditional optical microscopy and markedly improves the depth of focus. 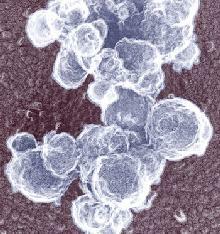 Electron microscopy provides much greater detail than optical microscopy. However, since not light but a focussed beam of electron is used to enlarge the image of the sample, the resulting micrographs cannot be in colour but they consist of various shades of gray. Individual components are distinguished through differences in their affinity for various heavy metals such as osmium, ruthenium, lead, and uranium. Minute gold granules of dimensions on the nanometer scale attached to antibodies may be used to identify macromolecules (enzymes, protein-based hormones etc.) through immunological reactions. Colours have been added to the micrographs in this poster. This procedure may be used to emphasize different structures in the samples for educational purposes. 1. Transmission electron microscopy (TEM). The operation is reminiscent of optical microscopy. The electron beam passes through a stained section, a metal-carbon replica of a fractured surface, or a negatively stained suspension of particles on a thin plastic film and the enlarged image is observed on a fluorescent screen. 2. 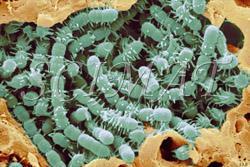 Scanning electron microscopy (SEM) is reminiscent of a dissecting microscope or a magnifying glass. It is used to enlarge the images of surfaces. 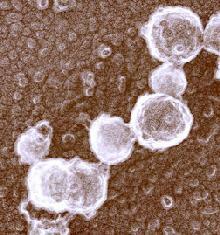 Conventional electron microscopy, both TEM and SEM is carried out in vacuo. For this reason, the samples under study must not release gases or vapours inside the microscope. In TEM this is achieved by embedding dehydrated samples in a resin and sectioning them or by examining metal-carbon replicas. In SEM, the samples are either dried or frozen at a very low temperature (-100°C or lower) and examined at the low temperature (cryo-SEM). A new system of environmental scanning electron microscopes has recently been introduced in biology and medicine making it possible to examine fully hydrated samples. In food science this will be particularly important for foods which retain cellular structure such as fruits and vegetables and foods which have a low water content such as seeds, bakery products or meats. 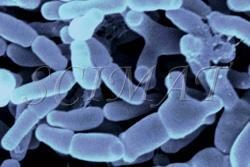 Both useful and harmful fungi (moulds) on foods will now be studied undisturbed by fixation or drying procedures. Most of my earlier studies were concerned with milk products. 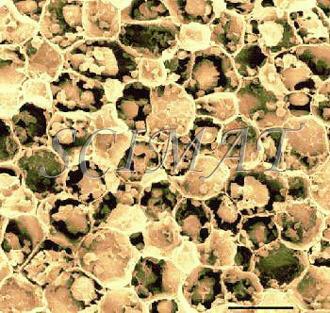 Milk appears "empty" under an optical microscope because the major protein (casein) is in the form of micelles, about 0.1 µm in diameter, i.e., below the resolution power of the optical microscope. 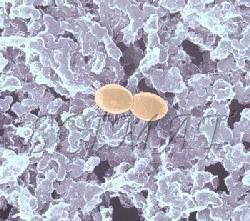 Milk products such as yogurt and cheese originate through the coagulation of the casein micelles. Heating of milk at >85°C alters the casein micelle surface. 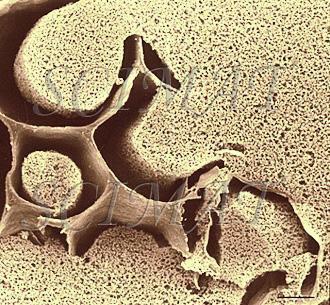 β-Lactoglobulin, as one of the two major whey proteins, interacts with κ-casein and the complex adheres to the micellar surface where it prevents the micelles from indiscriminate coagulation. Only short branched chains may be formed. The structure retains all the liquid phase of milk in yogurt. Unlimited coagulation of casein micelles takes place in unheated milk. It leads to concentrating proteins and milkfat in the curd and to an easy release of the whey. This is one of the first steps in cheese manufacture. Diagram showing dry-fracturing (left) and freeze- fracturing (right). 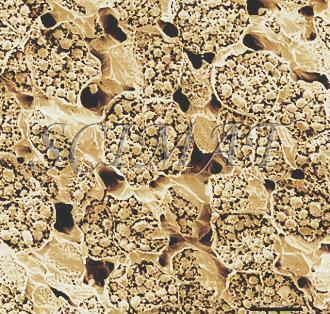 White circles: void spaces resulting from the extraction of fat globules. Dry fracturing breaks the sample at its weakest points. The resulting surface has a rough topography and the image is biased. A schematic illustration is shown at left using cheese as an example. In contrast, freeze-fracturing produces large smooth fracture planes irrespective of the sample's weak points.  (The upper parts removed from the samples are shown in very light colour). The dehydrated sample is first impregnated with absolute ethanol and then rapidly frozen and fractured in liquid nitrogen. Fragments are thawed in absolute ethanol and critical-point dried for mounting. Unlike water, absolute ethanol produces no crystals on rapid freezing and does not damage the samples by ice crystal formation. Mozzarella cheese has a fibrous structure as the result of curd stretching. In a cross section, this cheese differs only slightly from nonstretched cheeses. 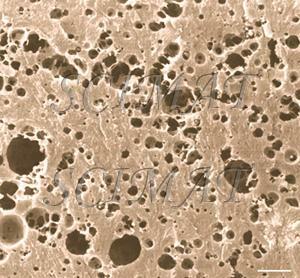 The void spaces shown in the micrographs indicate the locations of fat globules in the original samples. They had been extracted prior to SEM. Longitudinal fractures, however, show an oriented, "fibrous" microstructure. The protein "fibres" are even thinner in string cheese. Stretching has been replaced by extrusion in joint experiments with Dr. Barbano and Dr. J. Yun at Cornell University. SEM was used to study the effects of various manufacturing and extrusion parameters on the microstructures of the products. The microstructure of fresh and roasted almonds shows marked differences not only because the two samples had been fractured in different ways. The cells were tightly packed in the fresh sample but their contents appear contracted after roasting. The minute pits are void spaces developed in the matrix following the extraction of oil bodies. Also brazil and cashew nuts show similar pits. Tofu is curd made by coagulating soy milk. It originated in ancient China but its name has come from Japan. Salt coagulants such as calcium sulfate or calcium and magnesium chlorides, acid coagulants (glucono delta-lactone), or enzymatic coagulants (papain from papaya or microbial proteinases) are used to produced the curd. A tofu sample at left shows a fine protein gel as the major constituent and cell wall fragments as the minor constituent. Freeze fracturing has produced images which would permit drawing conclusions on the protein chains and the pore distribution. However, the void spaces between the minor constituent represented in the micrograph by the soybean cellular walls and the major constituent (the gel) indicate that the gel contracted during sample preparation (fixation and/or critical point drying). A gel made from soymilk of higher purity would not show the cell walls and thus would not reveal how the gel matrix contracted. This artifact is also common with other food gels including cheese. 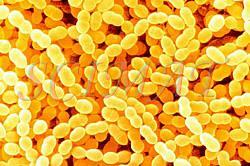 Pectin is a plant constituent important in human nutrition as dietary fibre. Located in the middle lamella between plant cells, pectin binds the cells together. Its degradation in ripening fruits loosens the cells and results in the softening of the fruits. Pectic substances have gelling properties and are thus used in the preparation of jams and jellies. Pectin filaments in a gel are considerably more difficult to visualize than protein chains in yogurt or tofu. Unlike proteins, polysaccharides are difficult to. Replication of freeze-fractured gels with platinum and carbon is probably the best method to obtain artifact-free images. Attempts to visualize pectin filaments using negative staining have been partially successful. However, the effect of drying on the negatively stained sample is difficult to evaluate. Pectin macromolecules are known to rearrange and change their microstructure very easily. 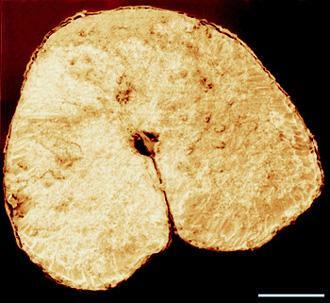 The image at left shows tomato pectin coagulated by ethanol following freeze-fracturing and replication of the dry sample. This technique was developed by Dr. G. H. Haggis at the Research Branch in Ottawa many years ago. It has been successfully applied to foods (see the micrograph of Cottage cheese at the beginning of this article). 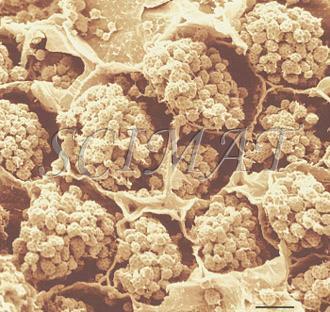 TEM images of gelling polysaccharides negatively stained illustrate the paper entitled Electron microscopic studies on the ultrastructure of curdlan and other polysaccharides in gels used in foods published by T. Harada et al. in Food Structure 10(1), pp. 1-18, 1991. 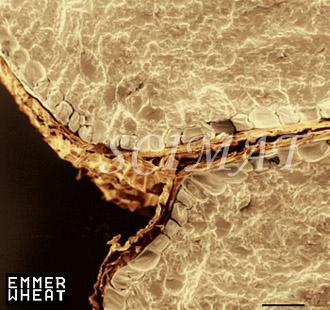 Scanning electron microscopy of various wheat grains studied by Dr. Elsayed Abdelaal has been initiated recently. All images shown above have been obtained by dry-facturing grains of soft and heard wheats. The image of puffed wheat was obtained by impregnating grains with absolute ethanol, cutting them in half and freeze-fracturing the halves. It is evident that there is a great variety in air cell dimensions and the cells appear empty. 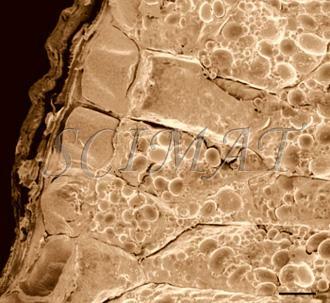 To calculate the dimensions of puffed cells, light microscopy may be more suitable than SEM. This is only a very small selection of foods featured. Similar to other technological disciplines, structure of foods is very important in food technology. Many food characteristics, physical properties and also the mouth feel are closely related to microstructure. 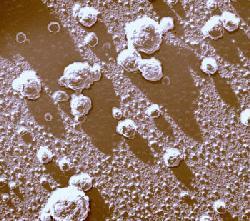 In an article entitled Conventional Scanning Electron Microscopy of Bacteria, published in the June 2008 issue, pages 42-61 of infocus, Proceedings of the Royal Microscopical Society in the UK, authors M. Kaláb, A. F. Yang and Denise Chabot described some of their laboratory experience with this subject. 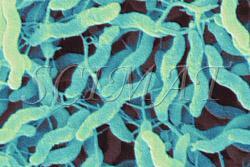 The article is illustrated with 14 images, 9 of which are in colour, including several false-colour micrographs. 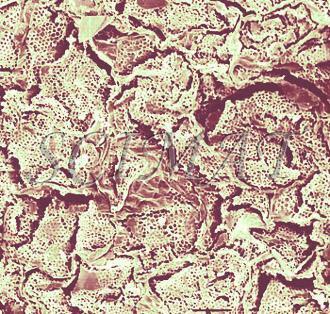 Some of the techniques described may already be found at this group of websites, such as surface replication or bacteria on hard surfaces, the detrimental effect of double-sided sticky tape to mount bacterial filters on aluminum stubs, and the construction of stereograms (anaglyphs} using SEM. 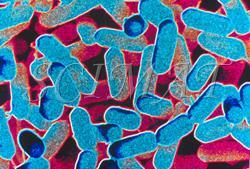 The photograph shown at left has been included in the article in response to requests for details about capturing bacteria (either live or fixed) on bacterial filters. Polycarbonate filters, 13 mm in diameter, particularly the matt side, seem to be the best for conventional SEM, where the samples have to be fixed, dehydrated, and critical-point dried. A preliminary treatment of the filters with a 0.1% solution of polylysine hydrobromide facilitates adhering of the bacteria to the filters. A filter holder with a fine stainless steel mesh as part of the Millipore Swinney Stainless, 13 mm filter (Cat. No. XX30 012 00) filtration syringe) has proven to be very useful when mounted on a vacuum flask using a short flexible tubing. The flask is attached to a vacuum line through a cotton wool filter and a valve. Bacterial suspensions are applied through a pasteur pipette onto an inclined filter. A greater volume of the suspension is filtered through the lower part of the filter, which means that the bacterial layer is thinnest at the top part and is thickest at the lowest part of the filter. Thus, there develops an area with the most desirable density of the bacteria somewhere on the filter. The bacterial layer changes the reflectivity of the filter surface. 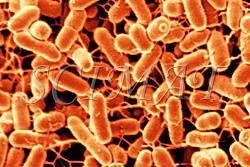 With some experience, the laboratory worker will always achieve the proper density of the bacteria on some part of the filter. The application of vacuum is stopped as soon as there is no visible liquid on the filter but the filter (and the bacteria) must still be wet when transferred either into a fixative or, if the bacteria have already been fixed, into 20% ethanol for dehydration. 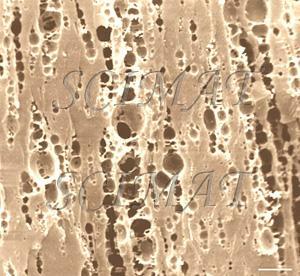 Samples such as yogurt or tofu discussed earlier, are best examined by conventional SEM after they are freeze-fractured. The samples need to be fixed and subsequently impregnated absolute ethanol. The samples are frozen in liquid nitrogen although it is an inefficient cryogen. It is a liquid at the temperature of its boiling point. When a specimen is immersed into it, an insulating layer of gas surrounds the specimen and decelerates the freezing rate. There are several procedures to improve the freezing rate. Better cryogens such as Freons are environmentally harmful and their use has been discontinued. However, freezing in liquid nitrogen is not detrimental to specimens impregnated with ethanol since this solvent does not produce ice crystals when frozen. Thus, there is no risk of developing freezing artifacts. The frozen samples (1x1x10 mm)immersed in liquid nitrogen are fractured using a pair of insulated tweezers and an insulated scalpel (photograph at right). (The easiest way to obtain them was to insulate regular tools in the laboratory.) The fragments are picked up one by one and thawed in absolute ethanol at ambient temperature and are subsequently critical-point dried (CPD). The fracture planes are shiny under reflected light and they should face up when the fragments are mounted on aluminium SEM stubs. 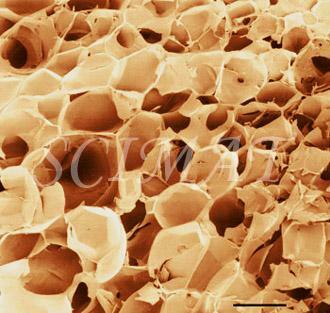 Double-sided sticky tape on the face of an SEM stub facilitates their positioning. Minute droplets of a conductive silver cement at the proper viscosity are then carefully painted on the side walls of the fragments to attach them to the tape. A cement too thick may not properly adhere to the specimen whereas a cement too thin may soak into the specimen and ruin it. The fragments acquire electrically conductive surfaces after they are sputter-coated with a 20 nm layer of gold. They are then ready to be examined by SEM. The article in the infocus Proceedings also describes, how grayscale micrographs may be coloured, using graphic software. Finally, the article lists several on-line sources of micrographs in false colours available for illustration purposes from specialized microscopists, e.g., www.denniskunkel.com, www.scharfphoto.com, www.microtechnics.com, www.scottcamazine.com) etc., or from various scientifically oriented photobanks such as www.sciencesource.com, www.cmsp.com, www.mediscan.co.uk, www.visualsunlimited.com, www.sciencephoto.com/ and others. 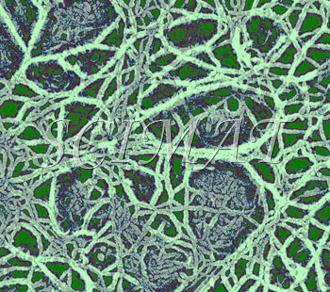 Information about foodborne microorganisms by Dr. R. Wheatcroft and websites accessible from the home site are also illustrated with micrographs.